I’ve decided that I’d look through Monkey’s birthday and Christmas presents from 2012 and see what is still in favour 3 months down the line! Having seen some good write up’s on the Vtech Switch & Go Dinos range we suggested that one of our relations buy Monkey theVtech Lex the T-Rex Switch and Go Dinos for his 3rd birthday last year. He didn’t have any kind of interactive or transformer style of toy, so I thought it would make a good ‘first’. It was an instant hit with both of us! Lex is made of thick durable plastic (a manufacturer that gets what a 3 year needs!! 🙂 ), so ideal for younger children to manipulate easily and without parents worrying about breakages! Lex can be transformed, easily from a Racing Car into a T-Rex, so great for keeping kids interested. He comes with an interactive built-in screen, so you can select different faces and learn lots of interesting Dino facts, he also makes some great noises. The packaging gives you a good idea of what he can do and he comes with good, clear instructions. The sound level can be adjusted, which I always find a useful option. Lex will automatically switch off if his button’s aren’t pressed for a while; thus saving the battery life. He uses 2 x AAA batteries. As I said, Lex has been our first venture into this kind of toy and my son has certainly enjoyed playing with it, and changing it from a Dinosaur to a car and different configurations between. He hasn’t got bored with it, which was a concern and it looks as good 3 months down the line as it did the day he received it – how often can you say that these days? 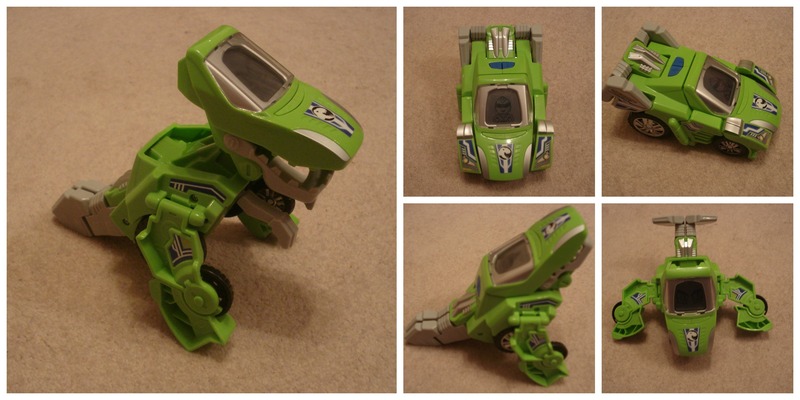 Vtech advise that Lex the T-Rex is suitable from 3 years + and I would agree with that classification. I think it’s well worth the £15.99 price tag and I would, and have, recommended it to others. He has definately lived up to our expectations. Disclaimer: The toy mentioned was a present and the opinions expressed are my own, honest thoughts. He is fab, I have a sneaky play myself when Monkey’s not looking. Even better now he’s starting to show an interest in real dinosaurs too. That is really cool. Like you I love toys that will withstand a 3 year old! I have to say that I think this is a major feature of this toy! My son should be a toy destruction tester!! I’m always finding flimsy bits of plastic that have ‘fallen’ off toys.